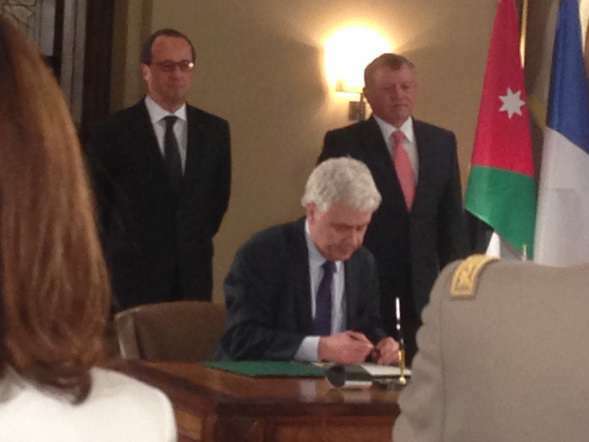 Nicolas Jachiet, Chairman and CEO of Egis, has signed an agreement with the Jordanian government for the improvement of drinking water supply in the governorates of the North of Jordan. This project in which Egis will provide technical assistance to the Yarmouk Water Company (YWC) will address problems relating to drinking water shortages in Jordan and connected with the huge influx of Syrian refugees into the country since 2011. The Yarmouk Water Company manages 80 million m3 of water per year. Between now and 2030, a further 30 million m3 will be necessary to meet drinking water requirements in the governorates of the North of Jordan (Irbid, Mafraq, Jerash and Ajloun). Since the beginning of the armed conflict in Syria in 2011, the arrival of refugees has compounded the problems facing the supply of drinking water, which was already under considerable strain due to growing demand for water, limited resources and a high ratio of water loss on the main network, otherwise known as non-revenue water (NRW). This led the Yarmouk Water Company to take the decision to launch a long-term programme to improve water distribution capabilities in each of the governorates in question. Over a period of 14 months, teams from Egis Eau in association with VINCI Construction Grands Projets will contribute their extensive technical skills to assist the contracting authority in the delivery of this vast project. This will involve performing work on existing networks (diagnosis, prioritisation, replacement and renovation) but also introducing operational and asset management tools, collecting data (taking measurements on the network) and analysing findings through the use of indicators. • Improve the quality of water supply and the revenue of YWC in some water service areas (by reducing NRW). • Develop and test innovative, measurable and performance-based approaches and methods to effectively reduce non-revenue water.